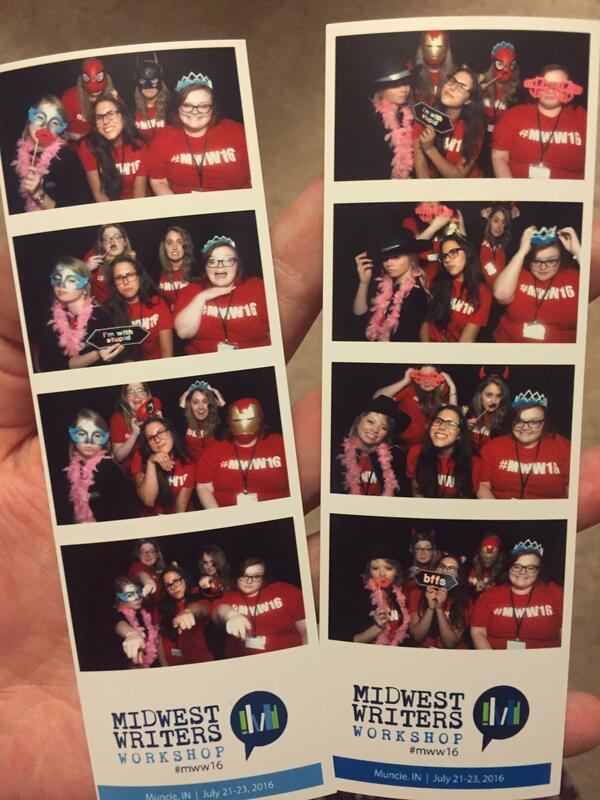 #MWW16: Diversity, Paper Hats, and Wonderful People, Oh My! In my last blog post, I described how terrifying the cursor over a blank page is, and now I’m facing that same dilemma. That same dilemma even though I have so much to say about MWW and so much love in my heart for the entire conference (from the insightful panels to photo booth fun with the loves of my life, AKA my fellow agent assistants). At the conference, I worked as the agent assistant for the incomparable Molly Jaffa, and let me just tell you all how much I admire her — I wish I could say I asked super insightful questions during downtime between her pitches, but I felt so tongue-tied (awkward and anxious person that I am) because she’s so good at what she does and that was simultaneously inspiring and intimidating. — Middle grade novels focus more on literal monsters, whereas YA tends to be more like “I am the monster because of my feelings” and about the emotional arc of the characters. Sitting in on pitches was so enlightening, especially as someone who’s always been on the verge of starting a YA novel, because everyone wants to write YA. It’s popular now, and that’s great, but don’t write it just because it sells. Middle grade is just as important and might actually be a better fit for the plot and characters you have. — If you weren’t already aware, I’m going to shout this from the rooftops — we need diverse representation in our literature. Molly is a huge proponent of this — one of the first things she said at the agent panel on the Friday I met her was a description of a book she’d signed about a girl who’s out as a lesbian but not out as a witch in Salem. How cool is that? And how important will that be for teenagers who haven’t come out of the closet? Be a proponent of diversity and equality in what you read, write, and share with the world. This is what Natalie C. Parker (whose books I can’t wait to start reading!) said was a reason she was so drawn to Molly as an agent above others, and it bears repeating. — On that same note — sensitivity readers. Find them. If you’re going to write diversely, don’t do it because it’s a trend, because it’s not (at his buttonhole table, Jim McCarthy explained this is one of the things he’s tired of seeing in his inbox). Try to attain authenticity instead of appropriation. — Literature, YA especially, works as windows and mirrors. Windows to see others, mirrors to see ourselves. I can’t tell you how much I’d loved hearing Molly ask a writer for a full manuscript about a girl with Down Syndrome, and I can’t tell you how difficult it was not to cry during Julie Murphy’s Keynote when she talked about seeing the movie Spy starring Melissa McCarthy. “Sometimes you don’t realize how hungry you are for your own reflection until you finally see it,” Julie said — and if you’re thinking that all I learned about was diversity at this conference, it wasn’t, but I think using this space to talk so much about diversity is crucial. I could talk about how much fun I had goofing around with the other agent assistants, because I had the best time in the world, but the pictures speak for that; to achieve diversity, we have to actively speak about it and champion it. — On a final note — paper hats are great at putting people at ease, and Molly makes great ones. Get your paper hats ready for next year, everyone — I’m sure it’s going to be equally (if not more) amazing, and I can’t wait to see familiar faces and new faces alike there! Author rachellauvePosted on July 24, 2016 November 29, 2016 Categories BSU English, Literary EventsTags diversity, julie murphy, midwest writers workshop, molly jaffa, mww16, writing, ya7 Comments on #MWW16: Diversity, Paper Hats, and Wonderful People, Oh My! The cursor looming over a blank document is terrifying, and finding time to open the document in the first place can be just as impossible as actually writing. Except I’ve recently asked myself this — is it actually so difficult to find that time to write or am I making excuses? What about the time I spend watching YouTube videos or re-watching episodes of Miraculous Ladybug that I’ve seen hundreds of times? Why am I not using that time to write? I recommend just watching the video to understand fully what she’s saying about drawing dates, but when I watched the video, I came away with an idea — writing dates. The premise is simple — find an acquaintance, a friend, a classmate, whoever, and go to a museum/park/etc. with the intention of writing and actually write. Use a painting as a prompt, describe what the kids playing Frisbee look like and what they might be thinking, or just write your thoughts. The point is to free write, and if you can multitask, talk with your friend at the same time. Bounce story ideas off each other, share what you’re reading — be actively involved in your own small literary community if only for thirty minutes while you sit on that museum bench or park bench. And if you’re not a writer? Maybe try a reading date. Bring a book you love, and have your friend bring a book they love, and trade. Sit and read for thirty minutes, an hour, think about why they love that book and appreciate its craft for what it is. Not only will you learn more about the other person, but you’ll have beaten that excuse of “Oh, I just don’t have time for reading and writing.” Make time for what you love and for your craft in the same way you make time for the people in your lives. Fire away, but keep reading, hear me out. I could attempt to hedge my statement by protesting that I only read it before bed, when I know a book would keep me awake, but I don’t think my statement should need any hedging — do you know why? Because fanfiction shows enthusiasm for reading, because fanfiction is writing for an authentic audience that wants to engage with what they’re reading, and that’s incredible. It was the teacher in me that asked Jane Friedman how to get students interested in publishing when they’re still learning their craft. I had expected some sort of answer about teaching students how the publishing industry works early on, but the answer I received was infinitely better and was something with which I was already familiar. She suggested Wattpad, explaining that writing in small chapters for established characters and universes not only allows for practicing writers to get on-site feedback, but also provides inspiration and motivation and helps to combat writer’s block and the anxiety coupled with that kind of block. Friedman’s words are golden, essentially, and are key to remember whenever we even think of looking down on fanfiction. People can be cruel and look down on poorly written fanfiction, but all writers start at differing skill levels, and all of these writers love what they’re writing about — don’t squash that love. Think about the last book you really loved. What did you do after you read it? I’m the type of reader to re-read the chapters and passages that I loved, sighing with content and hoping I’ll eventually write a book that causes the same reaction for someone, but words are finite, and there is only so much re-reading that can be done, which is where fanfiction can come in. When I’m rereading Percy Jackson for the hundredth time (fear not, dear blog readers; I will never stop mentioning my love for PJO), I eventually have to put the book down, but I can easily pick up my phone and pop over to AO3 and read anything from a canon-compliant fanfic from Annabeth’s POV to a Percabeth soulmate AU where Percy is in a band (something I recently read, and let me tell you, it was wonderful). And when I press “kudos” on that story, I’m letting that writer know that I think they did a good job, thereby supporting their craft and their enthusiasm. And that’s not even the best part — I’m working to better my own writing, because what’s the number one tip people give when asked how to become a better writer? In addition to being a Hamlet quote and the filler I put in rough drafts when I can’t think of what to write next, the phrase “words, words, words” sums up my entire life. I currently own over 400 books, book fairs and library trips were a constant presence in my childhood, and one of my first memorable bonds with a teacher was the result of my love of reading. My identity as a reader was one that I clung to, and it was an identity that led me to another identity, that of an aspiring writer. In one of the very first stories I ever tried to write, pounding away at the keys of my family’s old desktop computer, I essentially plagiarized the formula to The Lightning Thief, but with a female narrator. Although that file has been long lost along with that computer (thank goodness, it was awful), I still think about it from time to time, and the effect that reading Rick Riordan had on me. I identified as a reader long before I started reading Percy Jackson and the Olympians, but retrospectively, this moment was one of my most passionate moments as a reader. I was so inspired by a story that I wanted to capture that same kind of magic. This passion is part of what it means to me to be a literary citizen. Passion by itself isn’t enough, though, I’ve realized growing up. I could read by myself in my room and cry my heart out over the characters, but no one would ever know how I felt about that book if I didn’t talk to them about it. I grew up shy, and by nature, I am an introvert, but talking about books has always been something I could do. I surrounded myself with friends who shared my passion, to the point that we would play our own version of Harry Potter during recess, and I wrote pages of book recommendations for a friend in high school. I even went to the midnight release of Harry Potter and the Deathly Hallows at Borders (rest in peace, old friend) and watched fellow readers debate whether Snape was good or evil. I was part of a community of readers and writers even before I knew what literary citizenship was, just by sharing and talking about my passion for words. My passion has to manifest itself as action for me to be a literary citizen; action is key above all else, even if it’s a simple conversation. When I follow an author on Twitter, review them on Goodreads, recommend a book to a long distance friend (The Strange and Beautiful Sorrows of Ava Lavender by Leslye Walton — read it, trust me), discuss with classmates what we’re currently reading, I am acting as a literary citizen because I am turning my passion into support and discussion. I am planting seeds of passion in any way I can. That is literary citizenship.